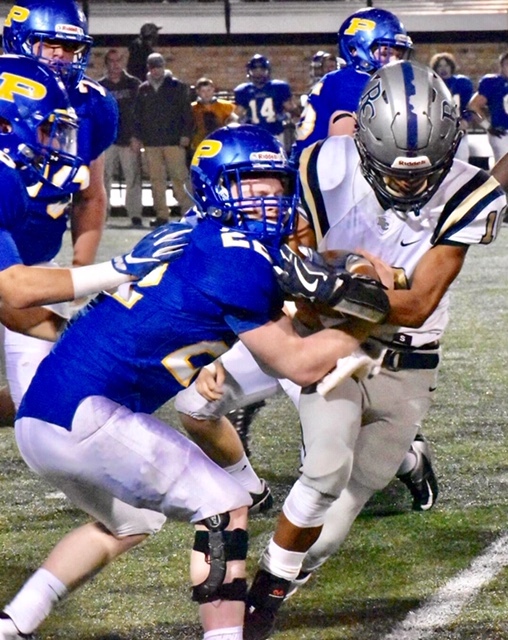 PIEDMONT – Piedmont rallied from a second-half deficit for the second week in a row and defeated Randolph County 26-21 to advance to the Class 3A State Championship Game next Thursday in Auburn. The Bulldogs (12-2) fell behind early 14-0 and trailed 21-8 late into the third quarter. Behind by seven with under five minutes to play, they scored two touchdowns in three and a half minutes, both passes from senior quarterback Mason Mohon to senior wide receiver Delo Foster – the second and decisive one coming with just 1:10 remaining in the game. Foster sealed the deal by intercepting a Hail Mary throw into the end zone by Randolph County’s DaMarcus Davis with no time remaining. Facing adversity with their season on the line, the Bulldogs never wavered, showing their championship mettle time-and-time again to scrape and claw its way to a State Championship berth for the third time in the last four years and fourth time under Smith. They won their last state title in 2016 at Auburn’s Jordan-Hare Stadium, beating Mobile Christian 22-12. Mohon shook off two early interceptions to throw four touchdown passes, three of which came in the second half to 6-foot-5 Foster, who likewise shook off a rough early start to rebound with a big second half, becoming a matchup advantage that Smith and company continuously exploited. Randolph County looked like a physical mismatch for Piedmont early on, as it manhandled the Bulldogs on both lines-of-scrimmage in the first half. Senior running back Atario Hester scored two first-half touchdowns that pushed the Tigers ahead 14-0. Hester had 130 yards and three TDs in the game. 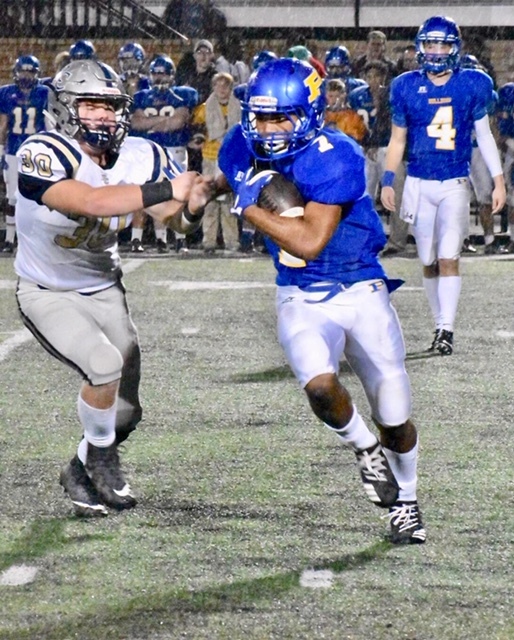 With Piedmont unable to find any offense, the defense kept it in the game, coming up with two critical first half plays that kept the Tigers from blowing the game open. Trailing 7-0 already and with the Tigers driving again on their second possession, sophomore defensive back Jakari Foster picked off a Davis pass in the end zone to squash the drive. The second play was a collective defensive effort in the second quarter, with Piedmont denying Randolph County in the red zone, stuffing them on a fourth-and-1 from the 5 to once again keep it a one-possession game. 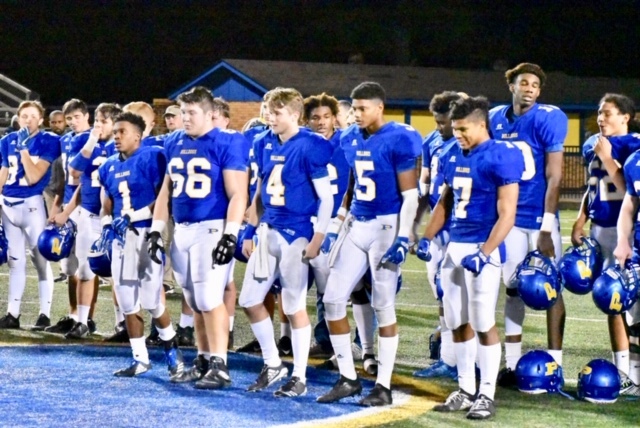 Piedmont’s inability to muster any first-half offense ultimately allowed Hester to run through a worn out Bulldogs defense for a 40-yard touchdown giving the Tigers a two-score lead late in the second quarter, but the crucial stops allowed Piedmont to stay within striking distance enough to stage a rally. Senior T.J. Fairs, who hadn’t touched the ball on offense up to that point, came up with a pair of big plays to finally get the offense rolling. Starting from its own 10 just two minutes before halftime and with only a single first down for the Bulldogs to show their first-half of offense, Fairs caught a pass for 16 yards, with a facemask penalty tacked on. He then took a jet-sweep around the edge for 14 more to put the Bulldogs in business. A big pass play from Mohon to Foster set up a seven-yard touchdown pass from Mohon to senior Carl Myers to cut the Randolph County lead to 14-8 going into halftime, allowing Piedmont to grab some momentum. That momentum was short-lived, however. After a big kickoff return from Dante Jordan to start the third quarter, Randolph County needed just three plays before Hester punched in his third touchdown of the night, stretching its lead to 21-8. After giving up 40 yards on the first three rushing attempts in the second half and 161 in the first half Piedmont’s defense tightened and allowed just 25 rushing yards on Randolph County’s final 15 attempts, keeping it out of the end zone for the remainder of the game. Mohon’s second half started just as sluggish as the first, with three straight incompletions compounding a frustrating evening. Something clicked for the senior signal-caller after that, however, and he completed his final eight passes, three of which went for touchdowns, to spark the rally. “I thought Mason came back in the second half and responded like a true champion,” said Smith. Mohon hit Foster on touchdowns of 31, 44, and 7 yards in the second half, never losing faith in his big receiver despite throwing both interceptions in his direction in the first half. Foster, after losing out on two 50-50 balls to Dante Jordan early in the game, shook loose in the second half and could not be covered. Trailing 21-14 with under five minutes to play, Mohon hit Foster for a 44-yard touchdown to bring the Bulldogs within a single point. They went for two and the lead, but the conversion failed, leaving them behind with not much time remaining. A quick three-and-out by the defense gave the hot-handed Mohon the ball back with a little over two minutes remaining, which turned out to be more than enough time for him to polish off his magnum opus of a second half with a brilliantly orchestrated final drive to win the game. Mohon hit a couple passes to Foster and then broke loose for a 17-yard scramble to put Piedmont first-and-goal. It would only take one more play. With Foster running a seamless corner route and breaking wide open, Mohon’s pass fell into his arms to the euphoria of a home crowd stunned by the remarkable comeback, regardless of how many times they’ve witnessed it. Foster put the bow on the win by picking off a desperation heave to the end zone to send Piedmont back to the state finals. Its opposition, Flomaton of Escambia County, survived a thriller of its own in the South finals, blocking a last-second field goal to preserve a one-point win over Providence Christian. For Piedmont, the victory was a little bit sweeter as it was able to avenge last season’s loss to Randolph County in the semifinals, ending hopes of a third consecutive state championship. It was the Bulldogs who couldn’t hold the early lead in that game, with Randolph County rallying from a 21-0 hole to shock the faithful at The Field of Champions. The Bulldogs flipped the script this time, adding another thrilling chapter to this budding rivalry. The mutual respect that has developed between these two programs the last couple of years is obvious; the last four meetings between the teams have been decided by a total of eight points.